This is a perfect addition to your Fall Wardrobe! keep the chill off your shoulders. and I actually designed this poncho for me. I kept it simple with a big button. 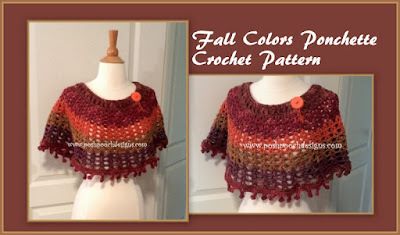 Any WW(4) yarn can be used For This Project. This is my new favorite item that I have Designed. Sizes - Sizes are approximates. Approximate Sizes in inches - at the neckline of the poncho. Gauge : 4sts = 2 inches Remember to measure as you go for the best fit. JOIN to 1st dc with a slst. If you would like a longer Ponchette, add more rows here. repeat From* to * around, join to 1st sc. 1 hdc in the next 4*, Repeat From * to * around. Join and tie off. Weave in the ends. sc evenly down the inside of the slit, then back up to the neck band. 6 sc over the chain loop, sl st to the neck band. Tie off and weave in your end. Sew the Button on across from the button loop. Yarn Stash Busting Leg Warmers Crochet Pattern! Yarn! Yarn! Yarn! Glorious Yarn! And Sweden.